The first time I saw my Grandmaman’s recipe for meatballs I thought “3 pounds of beef?! Who is going to eat 3 pounds of meat? !” (forgetting she often cooked for 15 of us =) Then I went and added a pound of pepperoni haha (something I learned from L’s mom that is a nice addition)… I’m going to Miami in a month and am on a diet I swear. 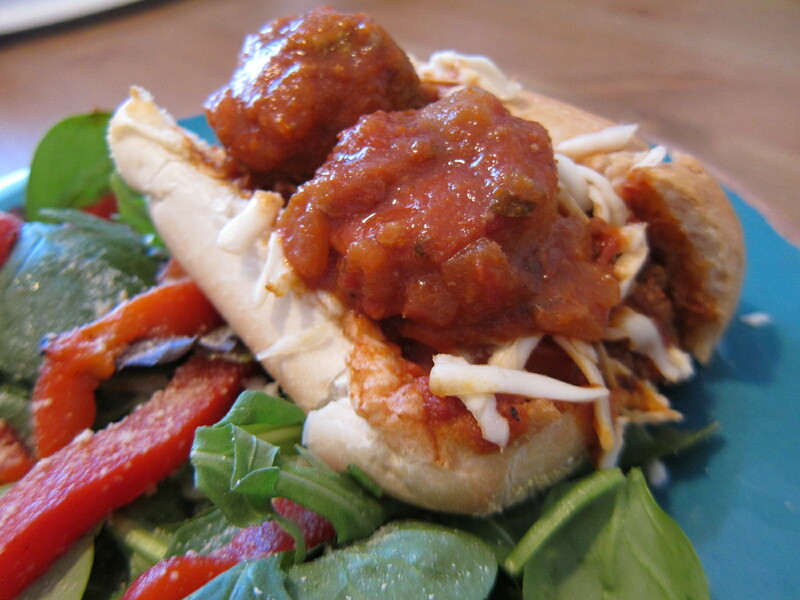 I decided to make meatball subs with some rolls from Dag’s (being from A*town, where else would I get rolls really?) and some “mozzarella”. In a large mixing bowl, soak the 3 slices of bread in water for 15 min. Using your hands squeeze and discard all of the water from the bread. Add in ground meat and eggs. Using your hands again, mix well and form meat into balls. I thought about how you’d possibly do this without using your hands and realized while you could maybe get away with a mixing spoon… there’s just no better way. Over the weekend I heard a story about a guy who would only eat his wife’s and mom’s meatballs. Perhaps this is why haha. Set meatballs aside. In a large stockpot (dutch oven is too small… someone found out the hard way and had to use 2 of them!) heat oil and add onions and garlic. Sauté until soft and golden. Add in spices and mix well. Next add in tomatoes, paste, broth, water and sugar. Bring to a boil then reduce to a simmer. Add meatballs and pepperoni to the sauce and continue to simmer for 1 hour. Add in mushrooms 15 minutes before the end of cooking. Your grandmum’s meatballs are delicious!